Berlin, 19 July 2018 -The German government has set the goal of covering 65 percent of the country’s power generation from renewable energies by 2030. From an offshore wind industry perspective, the German government is doing too little to achieve this goal. No concrete steps have been taken since the formation of government in March 2018. As stipulated in the coalition agreement, additional ten-ders for offshore wind energy and an increase in the offshore expansion paths are needed as soon as possible, alongside a rapid increase of the expansion paths for all renewables. The 65 percent target must be credibly supported by a quantity structure for the expansion. "The standstill in energy policy of the recent months must be stopped. We call on the Federal Government to decide on the special con-tribution for offshore wind energy immediately after the summer break. Otherwise, the self-defined climate targets cannot be achieved," explained the industry representatives. "The industry also agrees with the transmission system operators on this point." The expansion of offshore wind energy is currently proceeding according to plan until 2020. At the end of the first half of the year 2018, a total of 1,169 turbines with an output capacity of 5,387 MW are feeding into the grid. Five projects with an output capacity of 1,944 MW are under construction. Of these, offshore wind turbines with an output of up to 1,000 MW are expected to be connected to the grid by the end of the year. The share of offshore wind energy in total power generation increased from 2.7 to 2.9 percent (9.4 billion kWh - BDEW figures). The share of all renewable energies in power generation was ahead of lignite and hard coal for the first time in the first half year of 2018. From the industry's perspective, the German government must act now if it takes the 65 percent target seriously. This is also in line with recent decisions at European level that renewable energies should account for 32 percent of the EU's total energy consumption by 2030. To this end, the expansion targets must be raised across all renewable technologies. 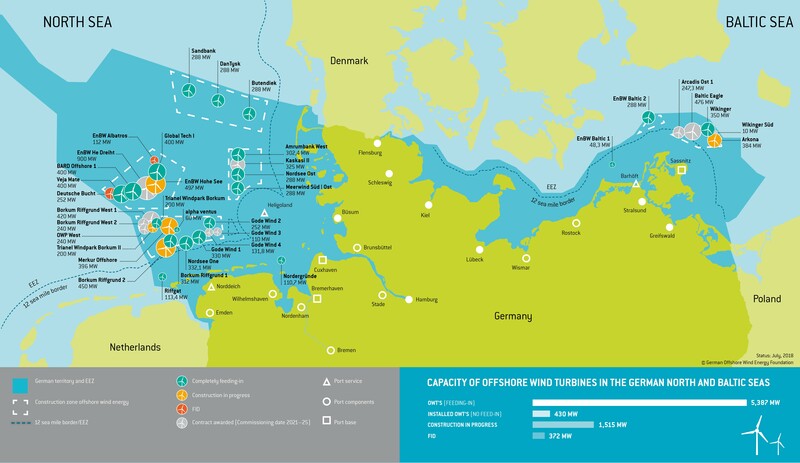 An expansion of at least 20 GW is required for offshore wind energy in Germany by 2030. At least 30 GW of offshore capacity must be installed by 2035. The existing expansion target of 15 GW by 2030 does not meet the Federal Government's new targets. The additional calls for tenders for renewable energies decided in the coalition agreement and originally planned before the summer must also be implemented. In the case of offshore wind energy, the course should be set quickly to introduce additional tenders in 2019 and 2020. This should include a total volume of at least 1.5 GW in the North Sea and Baltic Sea. These should be feasible through the use of free grid connection capacities. In addition, a higher expansion volume in the offshore wind industry is of great importance for employment security and value creation in Germany. Manufacturers, suppliers, operators and investors need a clear industrial policy perspective and investment security. Currently, more than 27,000 employees are working in the industry – their companies need investment security as soon as possible. "Oth-erwise, further investments and jobs in the wind energy sector will be endangered, as a recent industry survey conducted by IG Metall Küste shows," said the industry representatives. A sustainably stable domestic market is the prerequisite for the increasing export activities of the offshore wind industry. In addition to the expansion of renewable energies, the success of the energy transition in Germany depends largely on grid expansion and progress in sector coupling. The Federal Government should therefore give priority to the expansion of the large transmission grids and embody the many existing proposals for grid optimisation in law. For example, recent studies by the German Energy Agency dena and AGORA Energiewende have shown that a faster expansion of renewable energies is effectively possible through technical optimisation of the grid. Furthermore, regulatory hurdles for further cou-pling of the sectors should be removed as soon as possible. This includes the possibility of making elec-tricity from offshore wind energy directly applicable for the various Power-to-X applications.